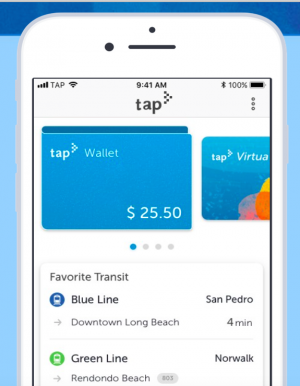 LA Metro Plans NFC-Enabled Mobile App for TAP Card But Holds Off on Open Payments | NFC Times – Near Field Communication and all contactless technology. The Los Angeles County Metropolitan Transportation Authority plans to enable customers to tap their smartphones to pay with a closed-loop "virtual' TAP card as early as next year. The authority, however, is holding off on supporting open-loop acceptance of fare payments. NFC TIMES Exclusive Insight – The Los Angeles County Metropolitan Transportation Authority, or Metro, plans to introduce mobile payments using NFC phones–but only supporting its closed-loop TAP fare payments service, not open-loop payments, NFC Times has learned. Although Metro has not rejected the idea of accepting contactless credit and debit cards, and other open-loop or open payments to enable customers to pay for rides on buses and rail services, it has no concrete plans to support open payments, a spokesman for the transit agency told NFC Times. That is similar to the decision of transit officials in the San Francisco Bay Area, as NFC Times reported last month, who plan to enable their Clipper closed-loop fare system to be loaded as a “virtual card” in NFC-enabled phones, allowing users to tap to pay fares with more than 20 subway, bus and ferry operators by late 2020. The Bay Area transit agencies and operators have no plans yet to support open payments. In Los Angeles, Metro spokesmen have told NFC Times that the agency’s “goal” is to enable a virtual closed-loop TAP card in NFC phones with a TAP wallet app, and also possibly a virtual card in Google Pay and perhaps other OEM Pay wallets. It might not hit that 2019 goal, however. Article has about 1180 words.